The following article was adapted from an interview on May 4, 2018 with with Dan Swords. This week’s Featured Writer Friday guest is Tom Slatin. My name is Thomas Slatin, and I am an American writer, photographer, and website designer. 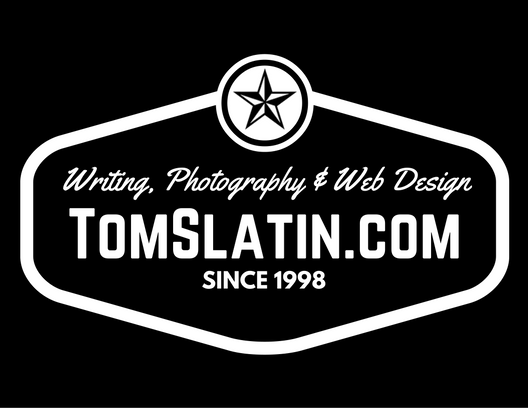 I run a hugely successful blog, TomSlatin.com, which is part photo gallery, part online writing magazine, and part web design resource. Somehow I manage to incorporate the greater part of two decades of web design, writing, and photography into my massive blog, which I update on a daily basis. I started using WordPress about 12 years ago, though I first started blogging in 2003 using Blogger.com. I have been proficient with computers since a very early age. I originally attended college for Computer Science with a focus on Information Technology and Internet, with a minor in English. Halfway through college I changed my major to Emergency Medicine and later trained to become a Paramedic. Realizing my ultimate dream was to become self-employed, I left college and pursued my own path. Prior to pursuing a career as a writer and photographer, I worked full time as an Emergency Medical Technician and Firefighter for a little over 17 years. At age 18, I was already a New York State Emergency Medical Technician; I later earned certification as a Firefighter shortly thereafter. My very first website was created using Notepad and HTML in 1994. By 1998 I was self employed as a website designer and had been hired as an independent contractor for a municipality to work as their webmaster and head of IT department. I have been writing and taking photographs using SLR and manual cameras since the age of 8. Today I create my images using a variety of vintage film cameras as well as the latest cutting-edge digital SLR cameras. I photograph mostly professional grade digital, through sometimes medium or large format film, specifically 120mm and 4×5 inches. Blogging was a spin-off from designing layouts and pages using HTML and tables. I had already made websites using Microsoft FrontPage, along with hand-coded CSS and style sheets, etc. Later on, NetObjects Fusion became my go-to application to manage the large amount of information I was putting online. Once blogs became vogue, it was much easier and more efficient to create a series of templates and have the information stored in a database, which was scalable, searchable, and well organized. My blog chronicalizes my creative career, specifically writing, photography, and website design. The goal of my blog, and the way in which my blog helps others is by informing, educating, and inspiring my audience. Specifically, a couple of years ago, an otherwise abandoned property was saved by a commercial developer after I posted photographs of it on my blog. Additionally, my original 80 Journal Writing Prompts went viral several years ago, reaching a peak of 21,000 views in a single day; it continues to perform well to this day. I get a lot of traffic to my blog, the overwhelming majority of my traffic comes from StumbleUpon, a lot of my traffic comes from Twitter, and LinkedIn. A small amount of traffic comes from other blogs, and Facebook but it isn’t much. Blogging tips and more from Tom Slatin. Facebook, for sure. I get little or no traffic or visits from Facebook. I have well over 20,000 followers on my Facebook page, though rarely, if ever, does that equate to any more than a small handful of visits to my blog. Additionally, I have had very limited success with sponsored posts on various social media platforms. I use WordPress exclusively for my blog. I also generate a lot of my visuals using Canva (canva.com). My blog would never have been successful without the addition of a lot of visual effects, graphic art, and of course, my original photography. Several pieces of advice are applicable here. First, if you have any plans to monetize your blog, either immediately or in the future, or if there is any possibility that monetization may be something you would one day look into, I suggest spending a little extra money and paying for your blog to be hosted commercially. One of the biggest mistakes people make is signing up for free blog hosts only to realize later on that they are restricted from making money from their blog and/or are restricted from posting various types of content. Find a web host that is right for you at the very beginning. I have uses DreamHost (DreamHost.com) since 2005, and their policy is the most lenient one I have ever encountered; basically, if it’s legal in the United States, then it’s okay to host with them. Second, do not post pictures taken with your cell phone. They may look good on Facebook or Instagram, but anyone who knows anything at all about photography will see your photography as amatuer. You certainly do not need to purchase an expensive camera similar to the ones I use, but you will still need to use quality images on your blog. There are many places to buy photography, often for very little money. A quick search for stock photography will likely bring up an exhaustive list of resources, far and beyond the scope of this article. Finally, network! Network with anyone and everyone who shares your interests, specifically any topics covered on your blog. And as far as topics are concerned, never have more than three topics covered on any single blog. You should be spending as much time writing and creating and publishing on your own blog as you do commenting and engaging with other bloggers. My blog has an open comment policy, so feel free to drop in and post a couple of comments on my blog. 9. Where can everyone find you?